Roofing Company Fitchburg: What Causes Roof Damage? While hail is fairly rare here in Fitchburg, we do get hit with the occasional storm. In fact, we got hit with six hailstorms back in 2015, and seven hailstorms back in 2008, according to StormerSite’s hail report. When hail is pelting your roof, it can cause damage. That’s especially true for asphalt shingle roofs. Hail can strike these roofing shingles hard enough to remove their protective surface. You’ll end up with granules that have been removed from your shingles’ surfaces. Hail can also damage wood shake roofs and metal roofing. Hail can crack and loosen wood shakes, leaving the subsurface completely exposed. Hail can also dent metal roofing; fortunately, metal roofing will still work the same as it did before the storm, it’ll just be pocked with dents and dings. In extreme cases, hail may damage slate roofs, especially older slate tile roofs. These roofs may crack or chip in extreme hailstorms. High winds can wreak havoc on any roofing material. In certain cases, it can remove tiles, shakes, or shingles completely. Keep a keen eye on your roof after a storm with high winds. You may notice that you have asphalt shingles with edges that are curled, or you may have shingles that are missing altogether. Wood shakes are also quite prone to wind damage, since they’re lighter than other roofing materials. High winds rarely damage slate tile roofs (again, due to their weight), or metal roofs (since they’re well secured with several screws). However, damage can still occur to these roofs in the most extreme cases. Your roof is build to shed water, not let it pool. That said, pooling can still happen. If, for instance, you have gutters that are completely gunked up with leaves, you can expect to see some water pooling near the edges of your roof. When water pools on your roof, the subsurface can absorb moisture, and water can seep into your home — and that can mean costly damage. Be sure to keep your gutters clear, keep debris off of your roof, and keep an eye out for pooling water on your roof. Do you have any large trees in the landscape near your home? If so, then you have a liability on your hands. Large trees are liable to lose large limbs, and those tree limbs can be a terror on your roof. If a branch is heavy enough, it won’t just scrape up your shingles — it can travel straight through your roof. It’s best to stay ahead of these hazards. Keep trees trimmed, and plant new trees far away from your abode. The structure of your roof is (hopefully) built with enough strength to support the weight of your roofing surface and more. However, the roofing material itself may not be impervious to weight. Keep from walking across your roof, unless you must, and keep maintenance workers from climbing across your roof as best as you can — the weight of an individual can be enough to remove protective granules from asphalt shingles, it can crack wood shakes, and it can be enough weight to break slate tiles (which can be extra costly and inconvenient). Also, be conscious that. come winter months, you could have tons of snow on your roof (literally). It’s best to keep huge masses of snow from accumulating on your roof. When snow piles on your roof, feel free to get in touch with us for roof snow removal. Your best defense against roof damage is your roof itself. Be sure to have your roof inspected regularly to ensure that you don’t have any weak points throughout your roof. Also, make sure that your roof isn’t outdated. Aged roofs can end up springing a leak, and it’s best to replace your roof before you end up with a costly issue. Fortunately, we’re always here to repair, maintain, and replace your roof. 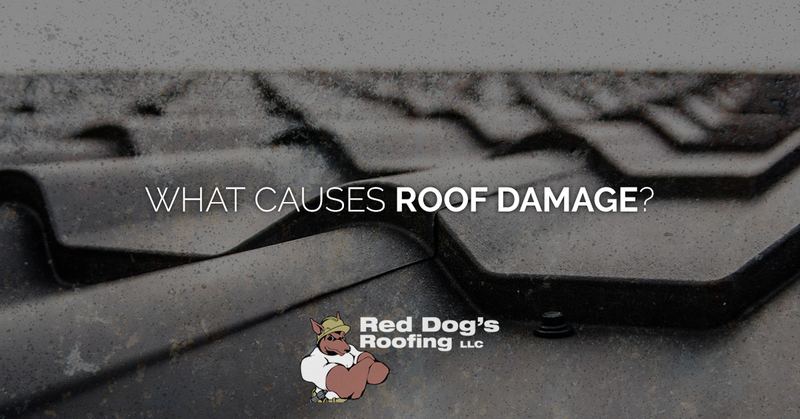 Count on Red Dog’s Roofing when you notice any damage to your roof. Get started today — call us to schedule an appointment! Count on our professional roofing crew if you live here in Fitchburg, Leominster, Gardner, or the surrounding area.